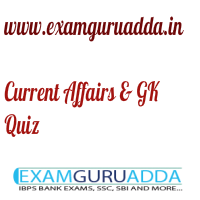 Dear Readers Examguruadda.in presents Current Affairs quiz of 5-6th December 2016 that cover important current affair events. Current Affairs quiz prepared according to the latest Bank, SSC and other competitive exam. 1. Which Electronic Commerce Company has launched a Startup Programme ‘Launchpad’ in India to support Indian startups? 2. Which Indian district became the first to pay wages to tea garden workers through individual bank accounts? 3. When is the International Volunteer Day observed globally? 4. Which nation’s Prime Minister announced his surprise resignation? 5. Who was elected as President of Uzbekistan? 6. Who was appointed as new CM of Tamil Nadu ? 7. Who was appointed as new PM of France? 8. Who is the oldest CM in India? 9. Who has been appointed as the CEO & Director of Airtel’s DTH arm? 10. Who will host the Oscars 2017?